EXAIR’s Vac-U-Gun: Blowoff or Vacuum with Just One Gun! 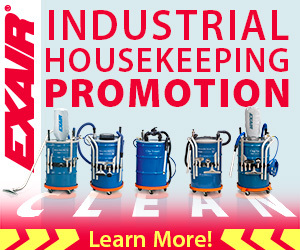 Now through the end of May, EXAIR is running a promotion on the Industrial Housekeeping Products that includes a FREE Vac-U-Gun with any purchase of an Industrial Housekeeping Vacuum System. EXAIR’s Vac-U-Gun is a low-cost solution to a wide variety of industrial housekeeping problems. The Vac-U-Gun has a durable die cast construction and no moving parts to replace or wear out. In addition to being easy to use, the Vac-U-Gun is also more efficient than ordinary blow guns. By injecting a small amount of compressed air through directed nozzles, a vacuum is then produced on one end and a high output flow on the other. The amplified outlet flow through the Vac-U-Gun is 12 times the compressed air consumption of the gun. The Vac-U-Gun is capable of both vacuuming material, as well as being operated as a blow gun. In vacuum mode, the work surfaces can be easily cleaned by vacuuming the debris away rather than blowing it off of the surface. Rather than simply moving the material around the shop floor, it can be contained and transferred to a waste receptacle using the 10’ vacuum hose, or straight into the filter bag. Switching from vacuum mode to blow mode can be achieved in just a matter of seconds. To change the Vac-U-Gun from vacuum to blow mode, simply remove the threaded cap and change the orientation of the generator inside. Since the Vac-U-Gun has a large 1-1/4” diameter air outlet, it covers much more surface area in less time compared to traditional air guns. This can help to reduce the time needed for a variety of different blowing, cooling, or drying applications. Due to the nature in which the Vac-U-Gun entrains ambient air, it allows for more force and flow through the gun at a minimal compressed air consumption. The Vac-U-Gun system is available by itself, or in one of three different kits. It can be used with or without the 10’ (3m) vacuum hose or the filter bag. Various vacuum accessories are included in the kits to accommodate a variety of different materials and applications. If you’re looking for a versatile gun that can help boost productivity in a number of applications within your facility, look no further than the Vac-U-Gun. When it comes to industrial vacuums, wouldn’t it be nice to have a durable, long lasting vacuum that is quiet? There is such a vacuum that has these qualities; the EXAIR Heavy Duty Dry Vac System. This vacuum system has no moving parts, no motors to fail, or bearings to wear. They only require compressed air to operate. The Heavy Duty Dry Vac is used to vacuum solid materials like plastic, sand, and even denser materials like steel shot. The vacuum pumps are made from a hardened alloy construction to resist wear and abrasion, and it is designed to generate a strong vacuum level measuring -60” H2O (-15 KPa) at 80 PSIG (5.5 Bar). To accommodate the multiple types of industrial applications, EXAIR offers the Heavy Duty Dry Vac Systems with different options and drum sizes. The unique design of the Heavy Duty Dry Vac is incorporated in the modified lid that will fit onto a standard 55-gallon, 30-gallon, or 110-gallon drum (209L, 114L, or 418L respectively). A 0.1-micron filter bag mounts in the center of the lid to allow excess air to escape and to contain the contamination inside the drum. The large surface area of the filters allows for extended use before replacement while the high efficiency will keep the fine particles from re-entering the environment. Under the drum lid, EXAIR used some features to help reduce the noise level even further. We added a silencing foam and an extended hose. This will muffle the noise and direct the contamination toward the bottom of the drum. With these additional features, the noise level is only 82 dBA at 80 PSIG (5.5 bar). Measure that against any electric vacuum. The Heavy Duty Dry Vac Systems come in three different options to best fit your application. The standard option comes with the drum lid described above and a latching ring to attach to the drum. It also comes with 10 feet (3m) of an anti-static hose, 20 feet (6m) of a compressed air hose, an aluminum chip wand, a hose hanger, a gauge, and a manual operational valve. This option is available with three different drum sizes. For example, model 6197 is for the 55-gallon drum (209L), model 6197-30 is for the 30-gallon drum (114L) and model 6197-110 is for the 110-gallon drum (418L). The second option is the Deluxe Heavy Duty Dry Vac System. This option will include all the items in the standard option plus aluminum tools, a tool holder and a drum dolly. The upgraded aluminum tools include a floor tool, crevice tool, skimmer tool with detachable brush, and a two-piece double bend wand. They are easily attached to the hose for quick cleaning of material spills. The Deluxe system is a great option for getting into tight areas, hard-to-reach places, and large floor areas. This option is also available in three drum sizes. For example, model 6297 is for the 55-gallon drum (209L), model 6297-30 is for the 30-gallon drum (114L) and model 6297-110 is for the 110-gallon drum (418L). If you do not have a drum to use in your facility, no problem. EXAIR offers a steel drum in the Premium Heavy Duty Dry Vac Systems. The Premium package has all the items in the Deluxe option plus a heavy-duty steel drum. We offer the Premium option for all three sizes as well. For example, model 6397 will include the 55-gallon drum (209L), model 6397-30 will included the 30-gallon drum (114L) and model 6397-110 will include the 110-gallon drum (418L). If you get tired of throwing away your electric vacuums for burned up motors, you should try the EXAIR Heavy Duty Dry Vac System. They will definitely extend the useful life, make it much quieter to operate and vacuum denser heavier materials quickly. For U.S. and Canadian customers, we offer a 30-day unconditional guarantee to try the units. 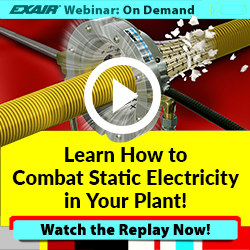 If you need help to determine which Heavy Duty Dry Vac option would best suit your application, you can contact an Application Engineer at EXAIR.